El Escorial is a remarkable Spanish town, located about 45 km northwest of the capital Madrid. Nestled in the foothills of the Sierra de Guadarama, the town offers many historical monuments in unique architectural structures. The official name of the town is San Lorenzo de El Escorial and can be easily reached by train or bus from Madrid. 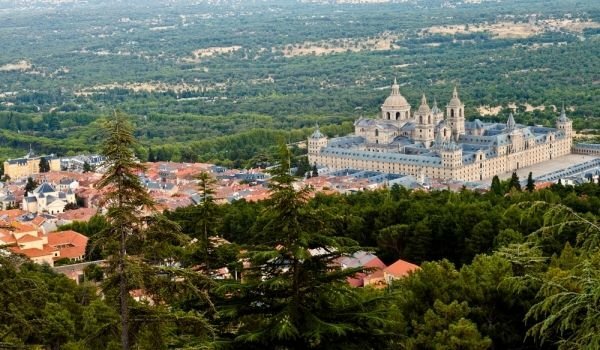 Undoubtedly the main attraction of El Escorial is the world famous San Lorenzo de El Escorial monastery, which in 1984 was listed as a World Heritage by UNESCO. This was the central political headquarters of the Spanish Empire during the reign of King Philip II. In 1557 the Spaniards defeated the French troops and destroyed the dedicated to St. Lorenzo hermitage. In its place the king vowed to build a new Relation building, resulting in the El Escorial palace. Construction began in 1563 and finished in 1584. The father of Philip II on his deathbed makes him promise that he would create a royal mausoleum in the church. Eventually Philip kept his promise and left a legacy in the form of a unique palace complex. This monumental architectural ensemble combines the royal palace, monastery and library. El Escorial has two separate architectural complexes of great importance to Spanish history: the Royal Augustinian monastery of San Lorenzo de El Escorial and La Fresneda, a royal hunting lodge, a few kilometers thereof, used for isolation by the Spanish kings. In the 16th and 17th century Escorial monastery functions as the official residence of Spanish kings. The strict facade of Escorial palace, with its gray granite walls marked the beginning of the new architectural style dezornamentado, which means "without ornamentation." The library and the Royal Pantheon and the baroque Basilica have a significant collection from the Habsburgs. Inside the Basilica of the El Escorial, in the chapel, one can see the unique crucifix, which is the work of Benvenuto Cellini. The library here has a vast wealth of 40, 000 books and manuscripts, and in the palace museum you can see works by Bosch, Tintoretto and Titsiyan.